On the morning of 6 December, Singapore time, I received one of the shocking news ever through the internet. Yes, one of the greatest political figure ever lived, Mr. Nelson Mandela passed away at the age of 95. It was really saddening, not only to the people of South Africa, not only to the inhabitants of the African continents, but to the entire human race. Mandela had dedicated almost his entire lifetime into helping his own people to find liberation in their own land. As tributes are flowing into the South African city of Johannesburg while I am writing this blog post, let us recap how this man brought about a revolution to his own country. Born in 18 July 1918 in Mveso, Transkei, South Africa, to a Thembu royal family. He was given a forename of Rolihlahla, which was commonly translated as ‘troublemaker’. However, he was later known by his clan name, Madiba. His father was supposed to be the chief of the clan. He served as a councilor to the tribal chiefs for several years before losing both his title and fortune over a dispute with the local colonial magistrate. When Mandela was 9 year-old, his father died of lung disease. His life changed completely this point of time. He was adopted by the acting regent of the Thembu people, Jongintaba Dalindyebo. He studied in a one-room school beside the palace, where he was exposed to African history, in which he developed an interest towards. He learned how the African people had lived in relative peace until the coming of the white people. According to the elders, the children of South Africa had previously lived as brothers, but white men had shattered this fellowship. While black men shared their land, air and water with whites, white men took all of these things for themselves. As a Thembu royalty, Mandela attended a Wesleyan mission school, the Clarkebury Boarding Institute and Wesleyan College, where, he would later state, he achieved academic success through “plain hard work.” In 1939, Mandela enrolled at the University College of Fort Hare, the only residential center of higher learning for blacks in South Africa at the time. Fort Hare was considered Africa’s equivalent of the University of Oxford or Harvard University, drawing scholars from all parts of sub-Sahara Africa. In his first year at the university, Mandela took the required courses, but focused on Roman Dutch law to prepare for a career in civil service as an interpreter or clerk—regarded as the best profession that a black man could obtain at the time. While he was at Fort Hare, Mandela was elected into the Student Representative Council. However, in alignment with the rest of the population who threatened to boycott the election due to their dissatisfaction about food and lack of power held by the council, Mandela resigned from the Council. He was subsequently expelled from the school. When he returned home, Regent Jongintaba announced that he had arranged a marriage for him. Upon hearing this, Mandela decided to run away from home and eventually settled in Johannesburg. While in Johannesburg, Mandela worked a variety of jobs and at the same time, completing his bachelor’s degree via correspondent courses. He enrolled into the University of Witwatersrand after that in order to pursue law. Mandela soon become actively involved in anti-apartheid movement, joining the African National Congress (ANC) in 1942. For the subsequent 20 years, Mandela directed peaceful, non-violent acts of defiance against the then South African government and its racist policies. These include the Defiance Campaign in 1952 and the Congress of the People in 1955. The law firm, Mandela & Tambo, he founded with Oliver Tambo provided free and low-cost legal counsel to unrepresented blacks. However, in 1956, Mandela and 150 over other activists were arrested for treason and were all acquitted of the crime subsequently. In 1961, Mandela, previously committed to non-violence struggle against the government, began to believe that armed struggle was the only way to achieve their aim. He co-founded the Umkhonto we Sizwe (MK), which is an armed wing of the ANC dedicated to sabotage and guerrilla war tactic to end apartheid. In 1961, Mandela orchestrated a three-day national workers’ strike. He was arrested for leading the strike the following year, and was sentenced to five years in prison. In 1963, Nelson Mandela was incarcerated on Robben Island for 18 of his 27 years in prison. During this time, he contracted tuberculosis and, as a black political prisoner, received the lowest level of treatment from prison workers. However, while incarcerated, Mandela was able to earn a Bachelor of Law degree through a University of London correspondence program.Mandela was brought to trial again. This time, he and 10 other ANC leaders were sentenced to life imprisonment for political offenses, including sabotage. A 1981 memoir by South African intelligence agent Gordon Winter described a plot by the South African government to arrange for Mandela’s escape so as to shoot him during the recapture; the plot was foiled by British intelligence. Mandela continued to be such a potent symbol of black resistance that a coordinated international campaign for his release was launched, and this international groundswell of support exemplified the power and esteem that Mandela had in the global political community. In 1982, Mandela and other ANC leaders were moved to Pollsmoor Prison, allegedly to enable contact between them and the South African government. On February 11, 1990, Mandela was officially released. The South African government then unbanned the ANC, removed restrictions on political groups and suspended executions. That same year, Mandela was elected president of the ANC and continued to negotiate with the South African government (led by State President Frederik Williem de Klerk) towards the country’s first multiracial election. 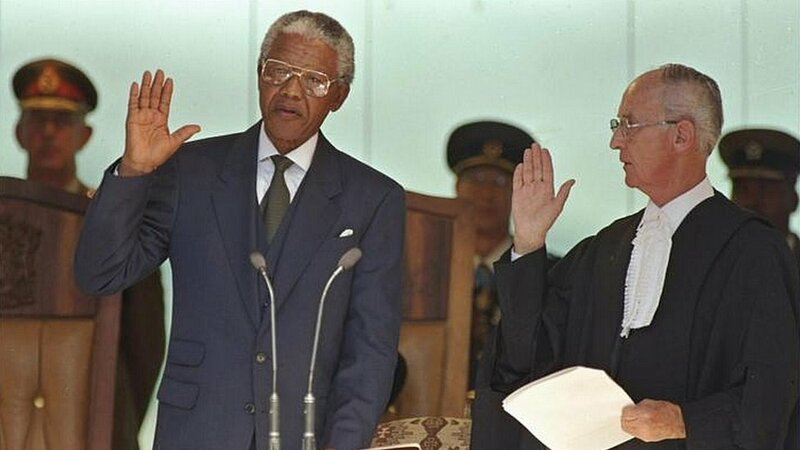 In 1993, Mandela and President de Klerk were jointly awarded the Nobel Peace Prize “for their work for the peaceful termination of the apartheid regime, and for laying the foundations for a new democratic South Africa”. The negotiation eventually turned out to be a success. South Africa held its first democratic elections. Nelson Mandela was inaugurated as the country’s first black president on May 10, 1994, at the age of 77, with de Klerk as his first deputy. Also in 1994, Mandela published an autobiography, Long Walk to Freedom, much of which he had secretly written while in prison. The following year, he was awarded the Order of Merit. From 1994 until June 1999, Mandela worked to bring about the transition from minority rule and apartheid to black majority rule. He used the nation’s enthusiasm for sports as a pivot point to promote reconciliation between whites and blacks, encouraging black South Africans to support the once-hated national rugby team. In 1995, South Africa came to the world stage by hosting the Rugby World Cup, which brought further recognition and prestige to the young republic. Mandela also worked to protect South Africa’s economy from collapse during his presidency. Through his Reconstruction and Development Plan, the South African government funded the creation of jobs, housing and basic health care. In 1996, Mandela signed into law a new constitution for the nation, establishing a strong central government based on majority rule, and guaranteeing both the rights of minorities and the freedom of expression. Freedom for the blacks in South African is finally being achieved. Thank you for all your hardwork that you’ve put in for the blacks. Thank you for showing the world that how important it is to build a multi-racial society away from racist policies and that racist politics has no right to be existing in this world. You are a leader. A legendary revolutionary figure. Your influence does not end within the borders of South Africa, neither it ends within the borders of the African continent, in face, your influence is of no limit. You did not only change Africa, but the world too. After 1994, everyone learnt that there can actually be equality of rights among the whites and the blacks, the yellows and the browns. In fact, because of your influence, skin colours have already made no difference in world politics: everyone is regarded as equal. Thank You for your existence. May you be in peace.